About Islam it has been said that of all the religions in the world, it is the only one which has evolved in the full light of history, and there is no part of its story which is in obscurity. The history of Islam-a movement which was launched by Muhammad, the Messenger of Allah, in A.D. 610 in Mecca, and was successfully accomplished with the support of his cousin & vicegerent, Ali ibn Abi Talib, in A.D. 632 in Medina. In these days many Muslims are also looking back nostalgically towards the days when Islam was united, as it was only during the lifetime of its Prophet, Muhammad. As soon as he died, the first crack appeared in the structure of Islam. His followers were polarized into two groups- most of his companions were on the one side and the members of his family on the other. While the members of his family were occupied with his last rites, some of his companions were occupied in electing a new leader to succeed him. During the interval between his death and his burial, the latter gathered in Saqifa in Medina, and elected one out of themselves as the new head of the Muslim community. They, then, confronted the members of the bereaved family with a vengeance. This confrontation became a permanent feature of the history of the Muslims. Muhammad, the Messenger of Allah, may Allah bless him and his Ahlul-Bayt (his family), belonged to the clan of Banu Hashim. After his death in A.D. 632, his cousin, son-in-law and heir-apparent, Ali ibn Abi Talib, succeeded him as the new chief of Banu Hashim. 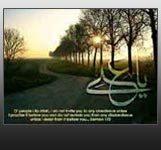 Many of the companions of Muhammad, the Prophet of Islam, had nursed a secret antagonism toward him which they could not show him during the lifetime of the Prophet but once they were in control of his government in Medina, they were resolved, not to let it fall into the hands of Ali ibn Abi Talib. The members of the family of Muhammad, the Apostle of God, were thus precluded, by human force majeure, not only from direct succession but also from all positions of authority and power in the successive governments of his followers. The friends, followers and supporters of the family of Muhammad Mustafa, the Messenger of God, have been historically called Shia; and the friends, followers and supporters of the companions, i.e., the party which succeeded in seizing power in Medina, have been called Sunni. Almost all histories of Islam have been written by Sunni historians. So why didn't Shia scholars write any histories of Islam? For an obvious reason-All khalifas, sultans and kings were Sunnis. A Shia could not publish an interpretation of Islamic history that was divergent from the official interpretation.In this manner, it was the official account of the history of the early days of Islam that gained currency and found acceptance. The most logical thing for the Sunni historians to do, was, and is, to uphold the legitimacy of the events which transpired in Saqifa, where some of the companions seized the government of Muhammad, the Sovereign of Arabia. Many Sunni historians have made a deliberate attempt to minimize the importance of the role played by Ali ibn Abi Talib in the story of Islam. What however is strange, surprising and shocking, is that the Western historians of Islam, have swallowed up, as gospel truth, whatever the Muslim court historians have offered to them as facts. A basic misperception in this regard is the acceptance by them, as a historical fact that Muhammad, the Messenger of Allah, died without designating anyone as his successor, and that he left the problem of finding a leader for the Muslim community to the discretion of his followers themselves. They have merely concurred with the Sunni historians that Muhammad, the Prophet of Islam, had no wishes or preferences in the matter of his own succession; and whatever happened in Saqifa was, therefore, right and justified, and also, was in the best interests of the Muslim community. For writing the story of the early days of Islam, there are three primary sources, viz., the Holy Qur’an; the Hadith (the memorials of the attributed acts and sayings of Muhammad) and the events as recorded by Arab historians. Out of these three, the first, i.e., the Qur’an, is acknowledged by all Muslims to be divine in origin. The Hadith suffer from a handicap; too many of them are spurious although there are some which are acknowledged both by the Sunnis and the Shias to be authentic. Therefore only those verses of Qur’an and only those Hadith (statements of the Prophet) in the interpretation of which the difference between the Sunnis and the Shias is minimal are quoted here.